IOU Foundation has always stressed on the importance of philosophy and spiritual science in the development of human civilization. Dr. Gulab Kothari has been one of the leading voices of the importance of Vedic science throughout the world. Vedic knowledge, widely considered as the epicentre of the spiritual learning, is the science originated from ancient Indian scriptures. 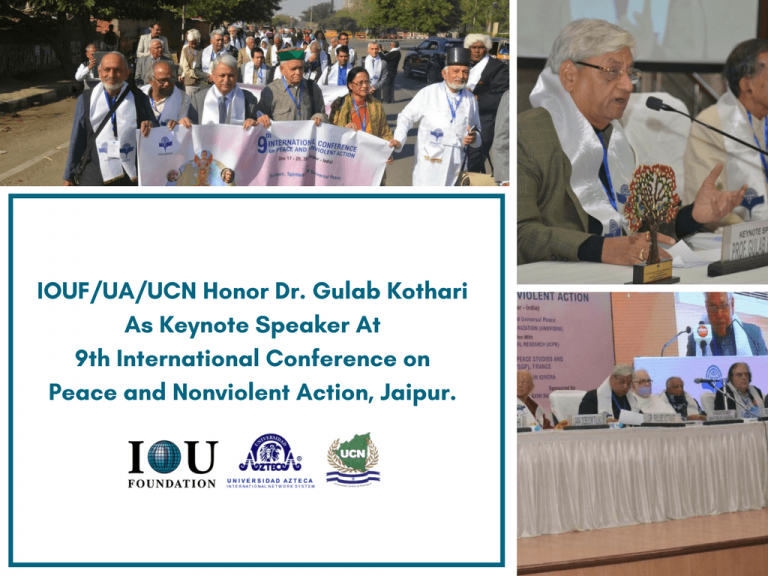 At the 9th International Conference on Peace and Nonviolent Action, Dr. Kothari was honored as the Keynote Speaker where he spoke on the form of the universe from a Vedic perspective. Dr. Kothari described how everything happening at the cosmic level is related to our daily lives. He explained the meaning of the popular Veda saying “yatha pinde, tatha brahamande” which means whatever activities that take place in the universe are exactly the same as experienced in our bodies. Dr. Kothari is an International Advisor to IOU Foundation. He holds a Dual Doctorate in Administration from IOUF’s partners Universidad Azteca and Universidad Central de Nicaragua. The IOU Foundation and its partners are proud to have individuals like Dr. Kothari as its alumnus.